Around 3 years ago, when we were still in Mexico, I received an email from a guy named Jason who lived in Rio. He said to let him know when we got here and we’d have a beer. Maybe because of the name (or maybe because of the beer offer), I remembered. Fortunately, I managed to avoid misplacing his contact info like I’ve done so many others. And, even better, he remembered us too. He’s a very cool guy who’s really into cars and starts stories with things like “…one time I was driving a Ford Model A down the Brazilian coast from Salvador to Buzios…” He’s working on a crazy plan to acquire the very last Brazilian VW bus off the manufacturing line (2013 is the final year) and drive it back to the VW factory in das Mutterland (route to be determined). We had plenty to talk about. And, it turns out… he’s a writer for the Rio de Janeiro newspaper! He asked us to meet up for a photo shoot and interview and it was really fun (but we didn’t manage to find the time to wash the bus!) We’re not sure when it will get published, but if you’re in Rio and can grab us a copy (or a photo of it) we’d really appreciate it! Congratulations! Now (07/ february /2013)…..What brazilian city are you? Hi! I am from Rio and I found your blog because of this interview. I loved your courage and idea. Good luck in your trip! 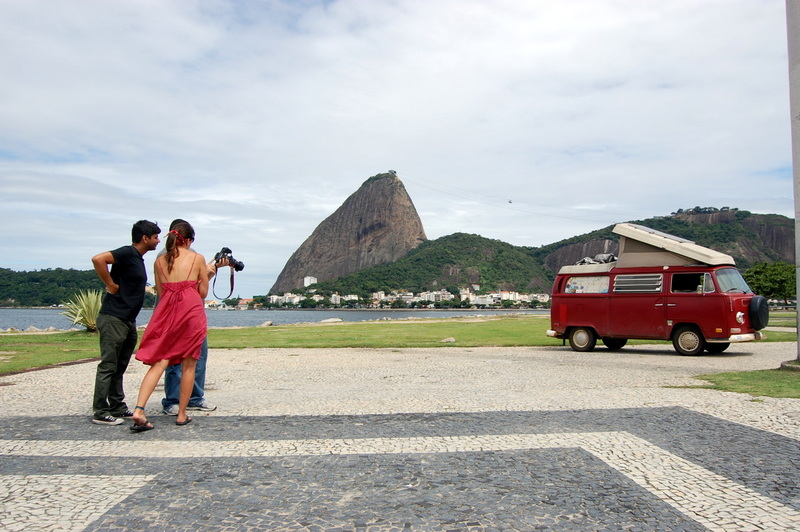 Tânia – we are now in Guarapari, but are considering returning to Rio for Carnaval! Your life is my dream for the future! Congragulations for believing in your dreams! hi, i’m not from rio, but i’m from brazil and i just read about you and your family on this blog: http://flaviogomes.warmup.com.br i just wanted to wish you all the good luck and fun in the world with your travel. consider going to small cities near Rio for a true old school carnaval with “marchinhas” and “blocos de rua”. and don’t leave brazil without watching a soccer game! i found your history very interesting. i´m an archtecture and urbanism student , i have as a monography subject moving urbanism. How can i find you in rio or niterói. It would be very nice to talk to you personally. Good luck in your trip, and please , e-mail me if you want to talk. You made I remove cobwebs of old projects of travel with Volkswagen! Vain with God, and good journey. Hi, what a wonderful history! 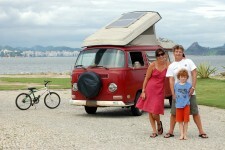 I have a VW Bus “motor-home” too. If you guys come to Belo Horizonte/MG – Brazil, please call me for a couple of beers! Luis – thanks for the offer… we just may do that! The guy who sent you the email is Jason Vogel. Welcome to our beautiful country! they have a lot of pleasant surprises for our Brazil! There are several Brazils in this country you will like! 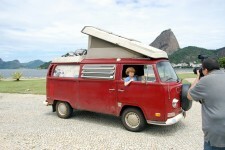 As you will notice there are many vw bus in Brazil ultimately remain in production until this year. Here is a link with camper models (kombi Safari Karman Guia) were sold much in the 70’s and 80’s here. And a good and stay in our country!!! Welcome to my cidade-natal! I live in south Dakota with husband and kids but grew up in Cosme Velho (rua itaminte, look it up) the seventh of a family of ten, and we used to hike to the Cristo statue many times by way of the railroad… For fun! I’d live to see inside pics of your kombi, do you have any? Safe journeys! Olá Jason, tudo bem com você e famílila. Tenho certeza que deve estar gostando muito do Rio, realmente é uma bela cidade. Como já sabe sou de São Paulo. 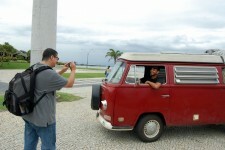 Essa sua aventura de Kombi é muito bacana. Vou continuar a te seguir pelo seu site. Boa viagem pelo meu Brasil. thanks everyone for the nice comments and emails! I’m following your trip, and that’s what I want to do some day. Anyway, I’m from Brazil, but since 2011 I’m in Belgium. I saw that you guys are planning come over those lands here. So when you guys come to Europe, Belgium, just let me know and we can meet eachother. And if you need any help here. I’ll be here, even to stay here in my small and cozy home. Good trip to you guys.